John Shirley Ceramics: Why Soluble Salts? 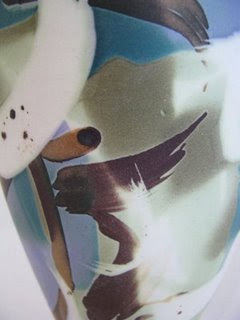 Because the metallic salts that I use for the decoration of my work are soluble they add a quality that could not be achieved with traditional oxide decoration. They are absorbed into the body and interact with each other reminiscent of watercolour painting. As you can see from the detail shown, the term watercolors on porcelain used to describe this technique is very apt. I have seen your work at your website and I admire it very much. My husband makes porcelain bowls and I decorate with soluble salts. We have now a problem to find cobalt chloride because of new worldwide safety regulations. Can you buy it and if yes can you give me the adress of your supplier?